Japanese food has always been influenced by other cultures in the process of forming a distinctive food culture. It was China in ancient times and western food has been incorporated since 160 years ago, the end of the Edo period. 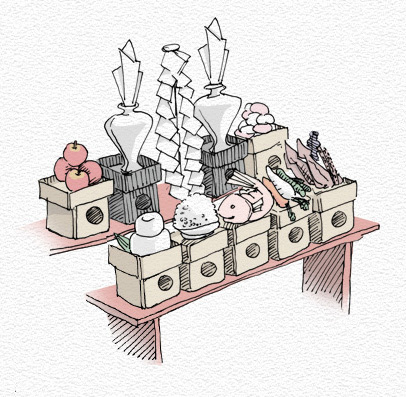 Our comport food Teishoku too has been evolving into what we know today by adopting various different influences. Here, we look into the roots of Teishoku while we trace back the history of Japanese food culture. People started to from as an alternative to hunting and gathering. Growing rice became popular and that shaped rice oriented food culture. “Kaiseki” cooking is based on the idea of “Shojin cooking” and arranged especially for tea ceremony. It also has an influence from “Honzen” cooking. 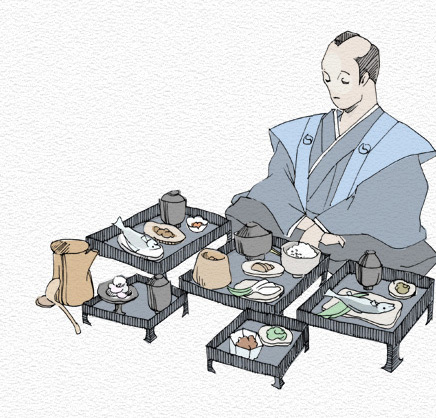 Ordinary people started to enjoy different kinds of food in the Edo period. Japanese food culture flourished during this time in the history. 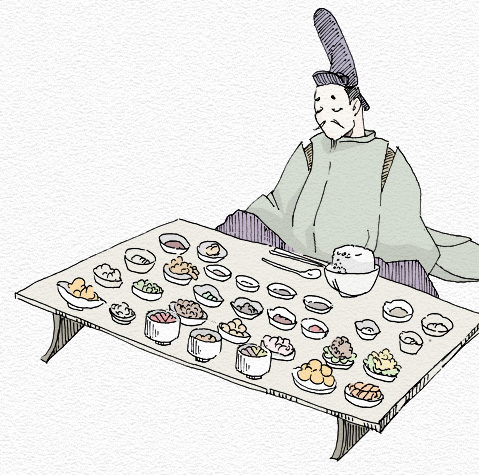 Ordinary people started to enjoy different kinds of food in the Edo period. Japanese food culture flourished during this time in the history. cooking and eating style to its food culture. After opening the country to the west in 1800s and overcoming the food shortage during and after the World War II, Japan has evolved its food culture by incorporating various foreign influences. Tracing back the history of Japanese food, we realize Japanese people had been flexibly adapting to the changes. Despite all these changes, having rice as the center of meal is something we have been passed down till today. Such tradition and solid framework makes us being flexible in food and Teishoku is what the tradition has evolved into. 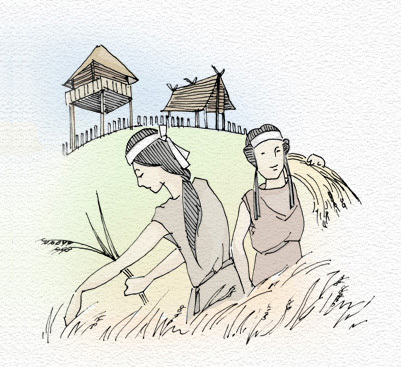 In Japan, we associated with "rice" now from the close in the Jomon period, about 3,000 years ago. When rice was transmitted from China, the meal of Japan changed from hunting collection to farming. And then, rice crop generalized after the Yayoi period, approximately 2,000 years ago, and food culture begins to develop mainly on rice. From those days, rice was precious food and was money. Exchanging production capacity of rice and measured land, and rice was value similar to　present money in Japan. We have worked hard to raise amount of production of rice. In Japan, we admired nature which brought the blessing of the meal with God and came since ancient times, and we have the mind to respect. We made various annual functions and festivals, traditions; means of the thanks of prayer and the crop of the good harvest and big catch. We gave "Shinsen" as a votive offering to God. "Shinsen" was a meal of God, and we were thinking that we were protected by God to eat a thing same as the meal. The mind and tradition are inherited at the present, and make the origin of the Japanese meal-style. The times go by, after 800s, "Daikyo cooking" was born as cooking for the upper social class. "Daikyo cooking" is the ritual dish with Japanese old traditional culture　and Chinese culture. Various dishes including the steaming rice serving highly and raw food and　dry food, and is dipped in seasonings such as salt, vinegar, sake, soy source, to eat. Chopsticks and a spoon were put on the low dining table, and there were various meal manners. That cooking style is the oldest known dish in Japan. 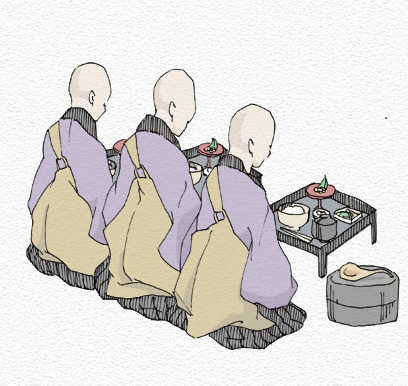 After 1200s, under the influence of "the Zen" came from China, "Shojin cooking" which removed animal raw food spread out. A new recipe was made, for example; add various seasonings and boil it, toss it, fry it in oil, backed by thought of quit carnivorous. At that moment, "Shojin Cooking" which began from the temple made new recipe, Miso soup, a sesame dish, dim sum, noodles, rice cakes, tea. These new cooking spread from the upper class through the common people, and had a big influence on food culture in Japan. After 1400s, "Honzen cooking" was born as cooking for the samurai　warriors. "Honzen cooking"　was offered to the each visitor in a low dining table. A number and the form of the dish vary according to the status of the person to treat, and it is a good point that all low dining tables come out at a time. Since Edo period, rice, soup, vegetable, and pickles were offered as "Honzen cooking", and also soup stock using a bonito and a seaweed; Kombu, a grilled fish, and a fish simmered in Miso were served. Foundations of Japanese meal-style are establishment. 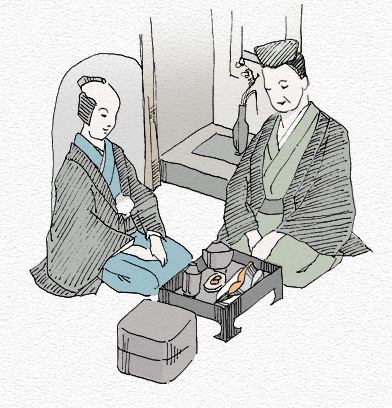 While, with the development of the tea ceremony, being affected by the "Honzen Cooking", "Kaiseki Cooking" was developed on the basis of　the concept and the cooking technology of "Shojin Cooking". The arrangement of "Kaiseki Cooking", consisting of one kind of soup and three side dishes, is a dish becoming basic of the current Japanese meal-style, while being particular about seasonal foods, and minding it that the space auspicious decoration. Even if "Honzen Cooking" dish was luxurious, we had to eat cooled down meal, because "Honzen Cooking" was for ceremonies and was cooking ahead. But "Kaiseki Cooking" laid emphasis on enjoying eating, so provides the warm thing warmly, the cold thing coolly. It was regarded as important that I valued the event of the temporary place. It is the dish which expressed mind of "ichigo-ichie" of the tea ceremony. 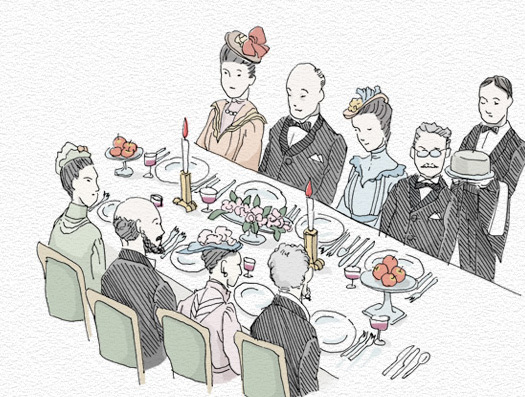 After 1600s, the common people enjoyed a meal, too. 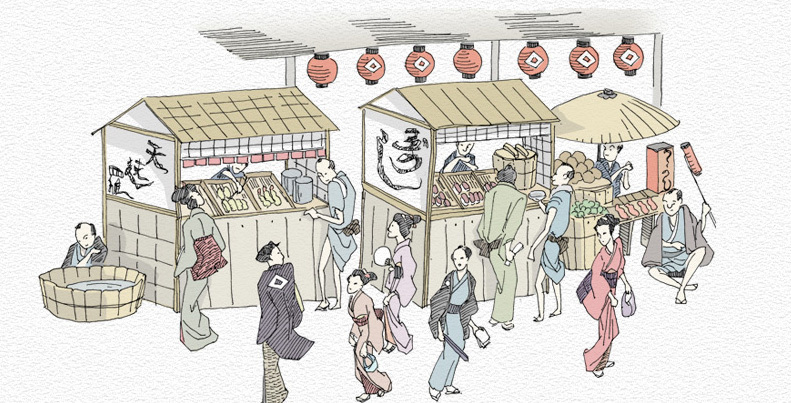 After 1800s, in urban areas of Edo, many food stands for common people increased to eat quickly, cheaply, delicious side food such as Soba, Sushi, and Tempura. "Kaiseki Cooking" were generated to enjoy liquor and a dish at a restaurant, and the publication of the recipe book increased, Japanese food culture greatly developed. After 1800s when I adopted Western culture positively, the Japanese meal-style greatly caught the Western influence. The times when meat comes to be eaten freely, and a lot of new ingredients such as foreign vegetables are imported, and the Japanese took in Western food culture spiritedly. and then the dish of compromise between East and West was born. Finally dishes were popular among the common people.